RediFire provides businesses with the best fire extinguisher service in Sanford, FL. State and local laws require all businesses to install and maintain fire safety equipment including fire extinguishers and emergency lights on their premises. In addition, our mobile fire extinguisher service, fire extinguisher inspection and emergency light repair helps businesses maintain compliance and ensure safety equipment is in working order in the event of a fire. All businesses in Sanford, FL are required to have an annual inspection of all fire extinguishers on the premises. 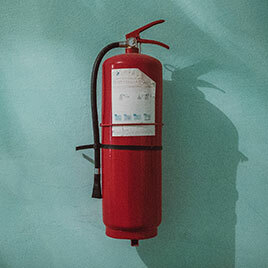 During a fire extinguisher inspection our trained technicians will perform the state mandated hydrostatic testing, verify that the extinguisher is maintaining pressure, the charging unit works, and the pins are in good condition. RediFire is a leading provider of promoting fire safety in our community. And with our mobile fire extinguisher service, trained and certified technicians will visit your business to perform required safety inspections of all portable extinguishers. Our mobile fire extinguisher service is available in DeLand, DeBary, Deltona, Orange City and other nearby communities. All commercial buildings are required to have emergency lights with a battery-backup. These emergency exit lights are a vital part of safety preparedness. They help direct people to the nearest exit in the event of fire or emergency. Emergency lights that are not in working order need to be repaired or replaced. Your local fire department may routinely perform unannounced fire inspections of your business and will verify that your fire extinguishers and emergency lights are operational. Businesses that are not in compliance may be cited. Whether you operate a convenience store, gas station, grocery store, shopping mall or any other establishment in Sanford, FL, our fire extinguisher service will inspect your fire extinguishers, ensure they are in satisfactory condition and affix an inspection certificate. To schedule your annual fire extinguisher service in Sanford, FL,contact us at (407) 474-0699 today!